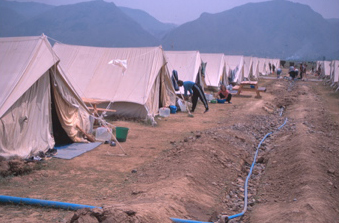 As a result of the war in Kosovo (1999), many refugees fled to Kosovo’s neighbouring countries including Albania. One of our medical teams was dispatched to Korce, Albania, to where many refugees had fled via Macedonia. Working in partnership with other medical aid agencies, our team offered primary and emergency healthcare to the refugees. A purpose built 4x4 mobile medical clinic was used to reach refugees who were being hosted by Albanian households in the outlying rural community. We also helped to repatriate the refugees back to Kosovo when the war ended. They were then able to see many of their patients in Kosovo, and to ensure their appropriate medical follow up in Kosovo. In addition, Iasis supported the hospital in Mitrovica, in the Serbian district of the town by roviding basic medical supplies and reconditioned equipment.